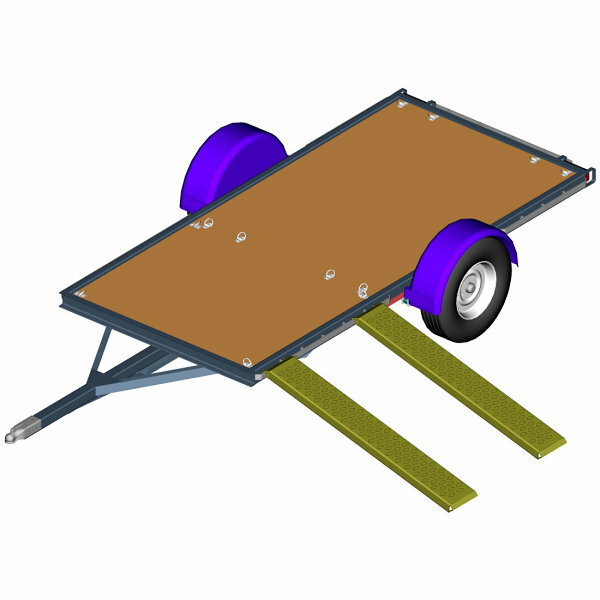 ATV trailer plans specifically designed for 2 ATV’s with the ramps needed to easily load and unload. Plans include several variations for customization like ramps that attach to the side for loading, and store under the trailer for traveling. This trailer has been engineered for strength, for functionality, and on-the-road stability! Check out all the features. Options for front shield and/or storage area. We offer two sizes of ATV trailers — Both versions accommodate 2 full size ATV’s. This is the smaller size (5’x 10.5′ bed), so it’s a little narrower and shorter but holds 2 ATV’s just the same. The narrower profile can be a benefit when towing with something other than a full size vehicle. The larger size (6’x 11′ bed) has a wider deck for a little extra bed space to carrying your extra gear. Both are designed for a single 3500# axle, and both come with lots of options for customizing the trailer to your needs. Note: Actual bed is slightly bigger than the stated size in feet. For Strength and simplicity, the ATV trailer plans show standard steel beams with triangulation for rigidity. Some other trailers are weak and require short sides. Not these. They are strong, by design, starting at the frame. Towing Stability, is achieved by adhering to the fundamentals, adjustable options for various load types and standard features like a tongue long enough for proper vehicle spacing and maneuverability. Design Versatility brings axle and brake options for load and bed height, various tie-down locations and types, sides (options and variations) if you want such a thing on an ATV trailer, several bed material options and a fold down tailgate/ramp. Ramps, and the Hidden under the bed storage option. Bed Material & Height Options. Front Storage / Shield Options. Optional Toolbox and Storage Mounting. And More … All specifically designed for ATV’s. Plans include the above options for customization, and when you build the trailer yourself, you can add things of your own to make it perfect. They also include a full list of materials, suggested parts and sources, complete illustrated instructions, full detailed drawings, (and more . . . ). Trailer bed actual size is 1.5″ wider, and 3.5″ longer than the nominal stated size. Overall length including the tongue is 52 – 58 inches beyond the indicated bed length. Max load capacity depends on the axle option, and includes the trailer weight. Several options are included with each set of plans to provide a variety of functions. Some options are mutually exclusive. Not all options are shown in the pictures here. Trailer weight varies with design options. Weight of the trailer increases with length, width and increased axle capacity.